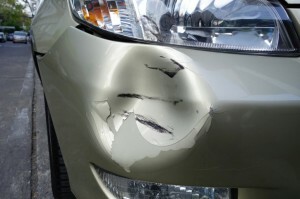 For body repair in Blaine, MN, North Star Auto Body can repair all makes and models of vehicles. From paintless dent repair to replacement parts for damaged cars and trucks, North Star Auto Body covers it all. If something doesn’t look “right” on your car or truck, let North Star take care of it so you’re satisfied. What are some of the reasons you would need body repair in Blaine? How about a fierce hail storm hits your car while it’s parked outside in the driveway, even though it should have been in the garage. Doh! Or how about this: you’re driving on 35W, minding your own business, when a huge rock drops off the truck in front of you and comes bouncing onto your car, putting dents in the hood, the roof and even the trunk before bouncing off into the ditch? It happens. Then there’s the “accidental” soccer ball hit your vehicle takes at the Blaine Soccer Complex, or the “ding” the vehicle got in the parking lot of the Victory Links Golf Course in Blaine. It’s always something, you know? North Star Auto Body is a full-service body repair in Blaine, MN ready to restore your vehicle to the way you want it after it has been dinged, dented or messed up. The workers at North Star take pride in their work, and can handle painting a vehicle to mirror a factory automotive paint job. In addition, if your windshield, sunroof, or other piece of glass on the vehicle needs replacing, North Star can do that, too. North Star techs are versatile and do a variety of body repair in the Blaine shop. From foreign to domestic vehicles, and even classic restorations, North Star Auto Body offers full service claim handling and a lifetime warranty. In other words, when you need the best body repair in Blaine, MN North Star Auto Body is the place to go.